Created in Nantes in 2009, the Festival Ciné Alter’Natif fights stereotypes pertaining to Native Americans by only screening films made or produced by Native American filmmakers. The festival has grown over the years and screenings take place in three different cities: Nantes, Paris and La Turballe. The 2017 edition celebrates music. 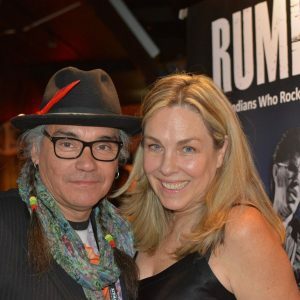 Reserve tickets for the opening event (Oct. 5), the premiere of the film Rumble or the closing Alvin Youngblood concert. I met with Sophie Gergaud, artistic director and co-founder of the festival to find out more about the festival, its origins and what’s to come. What triggered your interest for Native American filmmakers and their productions? S.G.: I’ve always been passionate about Native American culture. I discovered documentary film making during my studies in ethnology. I went to the United States where I met several Native American filmmakers and realized that they produced a lot of films. But it was hard for them to find distribution in the United States or Canada. I wanted to do something for them in France. I had been a devoted spectator at the Cinéma Concorde (in Nantes) and I mentioned the idea to its director. I also met Sophie Vaillant (co-founder of the festival) at the Concorde. That’s how it got started. Your festival is solely dedicated to films made on the American continent? S.G.: Yes, at first we only screened Native American movies. Our team is so small and there are so many films to see that it seemed like a gigantic task. This year, the main theme is music and I really wanted to screen a movie from Greenland I had seen a couple years ago in Toronto. It is called: Sumé, le son de la révolution. So for the very first time, we will screen a production from outside the American continent. And I think this is something that will stick in the future because it is a bit frustrating to limit ourselves to films produced on the American continent. The idea will be to have a majority of Native American movies, while opening a window for productions from elsewhere. In the past 10 years, there has been an enormous amount of films in any format (short, medium and long features) produced by natives from all over the world: Australia, Finland, Norway, even Russia. S.G.: Two main themes have emerged this year. The first theme is music. I had been waiting for a few years for the movie Rumble to be finished. I know this film quite well because I have been involved in its making. So every time I watched movies related to music, I added them to my list so I could screen them the same year as Rumble. That’s how that musical theme emerged. The other theme explores our behavior and politics in Europe and their impact on the native lifestyles and or livelihood. For instance, the movie Inuk en colère shows in a dispassionate manner how environmental politics prohibiting seal hunting, and which seem totally justify in our eyes, have had an enormous impact on the lifestyle of Inuit hunters. After they had already suffered from colonization and mandatory settlements. This is a strong movie that challenges us directly and invites us to think. The movie Rise is about the construction of the pipeline on the Standing Rock reservation. We could think: that’s far away and does not really concern us, but actually many banks, including French banks have invested money in the construction of the pipeline. So there again, our money and consumption modes have a concrete impact on the way of life of Native Americans. Everything is connected and we have to think about our actions. Even if our ideals might have some commonalities with those of Native Americans, on a day-to-day basis, our actions lead to different results. Rumble will premier in France on October 5. What has been your role with the movie? S.G.: I know the production team and was very involved early on. It all started with an idea from the musician Stevie Salas who initially contacted the production team. They consulted with me as an ethnologist. Catherine Bainbridge, the filmmaker, wanted to hire native collaborators from the get-go. It took four years to make the movie. It takes place all over the States and portraits 10 famous musicians from Seattle to the Mississippi Delta. I also had to conduct some research at the INA (Audiovisual National Institute) in Paris: some Native American musicians were totally looked down in their own country until they went to Europe where they became famous. We wanted to find footage for that. I also helped story edit the film, which was not an easy task as we had to present 10 stories and 10 different music styles. Despite all their differences, is there a common message emanating from Native people worldwide? S.G: Native people face completely different realities all over the planet, but they are all guided by the will to reclaim their right to self-determination and to make their voices heard. Why do we make a difference between movies made by Natives or movies made about Natives? A movie about Natives, as good as it might be, still retains the voice of an outsider, even if that person is close to their characters. It remains an outsider look. Even though we do need such viewpoints overall, the distribution is a lot more restricted for movies made by Natives. We have to listen to them, in their own terms. Let them choose their topics and their modes of expression. Give them the same freedom of speech and audience as enjoyed by non-Native filmmakers. Tags: cinema, film, Nantes events, native american films, Rumble.